In a letter to Congress Thursday, Nielsen asked for faster deportation of unaccompanied migrant children from Central America, as well as the ability to detain families while they await their day in court. Noting that Congress has tasked DHS with taking "operational control of the border," Nielsen wrote that "we are increasingly unable to uphold that responsibility given the emergency situation." 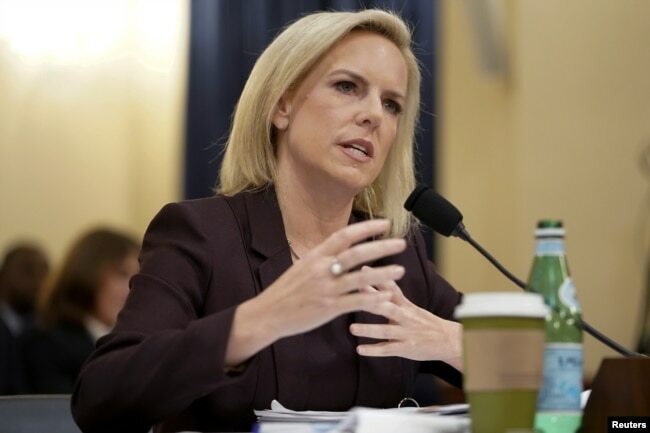 Department of Homeland Security Secretary Kirstjen Nielsen testifies before a House Homeland Security Committee hearing on “The Way Forward on Border Security” on Capitol Hill in Washington, U.S., March 6, 2019. In her letter Nielsen said that this month, DHS is on track to apprehend nearly 100,000 migrants. "We face a cascading crisis at our southern border," Nielsen said in a statement. "The system is in free fall. DHS is doing everything possible to respond to a growing humanitarian catastrophe while also securing our borders, but we have reached peak capacity and are now forced to pull from other missions to respond to the emergency." "The system was not built for this. Our laws are just not built for this," a senior DHS official said of the current arrival numbers at the border, during a call with reporters Friday afternoon. DHS has repeatedly attributed logistical challenges at the southern border to a shift in demographics — with an increasing number of families arriving, compared with single men in earlier waves. By law, families can be detained for only a limited time. Nielsen is asking Congress to extend that. She is also asking that children from Central America be treated the same way as Mexican children, who may be returned to their home country if they "have no legal right to stay." In the meantime, DHS is planning to pull hundreds of customs agents from ports of entry to aid in detainee processing, the agency announced Thursday. It has also asked for employees from across the department to volunteer for temporary placement to work at the border. Friday, for the second day in a row, Trump called in a tweet for shutting down the border if Mexico does not immediately stop all illegal immigration to the U.S.
Later in the day, Trump reiterated his tweets during remarks in Florida. "So Mexico's tough, they can stop them, but they chose not to, and if they don't stop them, we're closing the border. And we'll keep it closed for a long time. I'm not playing games." Asked whether the agency intended — as Trump threatened — to close ports of entry, the DHS official demurred, saying "it's short at the moment of a full closure of any port." The official added that the reassignment of customs officers to detention work at the border could reduce the flow of vehicles and pedestrians through ports, however, and cause delays. "What the president is making clear," the official said, is that if the agency has to close ports of entry, "we will do that," making the issue a possibility, rather than a fully made decision.